Dance Mogul: What can the world expect from Aidos? Douglas Dunn: Aidos celebrates the uplifting uselessness of bodies in aestheticized motion. The subtext of the piece is that no matter how hard we try, we humans, divided against ourselves, always battling, never get it right: individual/collective; mind/body; love/hate; beauty/ugliness. Dance Mogul: How is this production different from your previous work? Douglas Dunn: Aidos is deeply involved with its score, the Bach Cello Suites. The richness and complexity, the sublimity, of the music has put my wit in competition with an uncharacteristic urge toward earthiness and gravity. Dance Mogul: You’ve been creating for a long time now, what motivates you to keep creating these pieces to present to the world? Douglas Dunn: My dancing is a reaction to the always-looming triviality of daily living. Nothing is more important than the opportunity to arrive at impractical gestures that celebrate transient human presence, the meaning of which, if any, is inscrutable. My love for dancing, doing, organizing and watching it, just keeps increasing with age. Dance Mogul: You’re well-traveled, how does dance here in the states differ from dance in other countries? Are there different techniques? Is the appreciation level different for the arts? Douglas Dunn: The spectrum of dance practice and response in the world is very wide, and with the help of media one is now able, both at first and at second hand, to see a lot of it. There are also great differences in how dance is supported, artistically, emotionally and financially. Of all the countries I’ve worked in, the USA is the most unpredictable, as dance, and art in general, are not foundational to our pragmatic ethos. Dance Mogul: Is there anyone you would like to thank for helping you with this project? Douglas Dunn: Though no longer with us, my parents have been surprisingly present as I work. Mother used to say that when she played Bach I danced, age 2. It’s as if I’m returning to those moments, and to her deep involvement with music. My father was an outdoorsman. His robust, unself-conscious interactions with animals, mountains and lakes still run through me. His esprit provides an angle of inspiration that prevents my love of artifice from descending into cynically ironic decoration. Thank you! Douglas Dunn & Dancers presents the World Premiere of Aidos at Brooklyn Academy of Music, BAM Fisher, 321 Ashland Place, Brooklyn, NY, from February 11-15, 2015. Performances: Wed-Sat at 8pm, Sat & Sun at 3pm. Tickets are $20 and are available at www.brownpapertickets.com/event/1040421, by phone at (866) 620-7509 or in person at the BAM box office during the week of the show from noon to show time. Aidos, a new work by Douglas Dunn, features dancing by Dunn himself, Jules Bakshi, Alexandra Berger, Emily Pope-Blackman, Jin Ju Song-Begin, Jessica Martineau, Paul Singh, Jake Szczypek, and Timothy Ward to Bach Cello Suites performed live by Ha-Yang Kim, with design by Andrew Jordan and lighting design by Carol Mullins. Though highly stylized and elegant, as is typical of Dunn’s work, the piece allows Aidos, the Greek goddess of shame, to appear as a split personality danced by two six-foot tall women, Jin Ju Song-Begin and Jessica Martineau. Their ongoing duel, juxtaposed against six more affiliated dancers, is the focal point of the general suggestion of dance display as inherently embarrassing. The beauty of the Bach Suites played live by Ha-Yang Kim and the sleek black and gold costumes by Andrew Jordan keep the mordant theme from shredding the luxuriant texture of the hour-long dance. Douglas Dunn began presenting work in New York City in 1971. In 1976 he formed Douglas Dunn & Dancers and began touring the U.S. and Europe. In 1980 the Paris Opera and the Autumn Festival invited him to set Stravinsky’s Pulcinella on the Paris Opera Ballet. He has collaborated on film and video-dances with Charles Atlas and Rudy Burckhardt. He works with visual artists (Mimi Gross, David Ireland, Uli Gassmann, Jeffrey Schiff), composers (Joshua Fried, Bill Cole, Eliane Radigue, Alvin Lucier, Robert Ashley, Linda Fisher, John Driscoll, Ron Kuivila), poets (Anne Waldman, Reed Bye, Ruth Margraff), and lighting designer Carol Mullins, to present a multifaceted dance image. Dunn has received funds for his work from the New York State Council on the Arts, the National Endowment for the Arts, the John Simon Guggenheim Memorial Foundation, the Foundation for Contemporary Performance Arts, and other sources. In 1998 he received a New York Dance and Performance (Bessie) Award for Sustained Achievement. 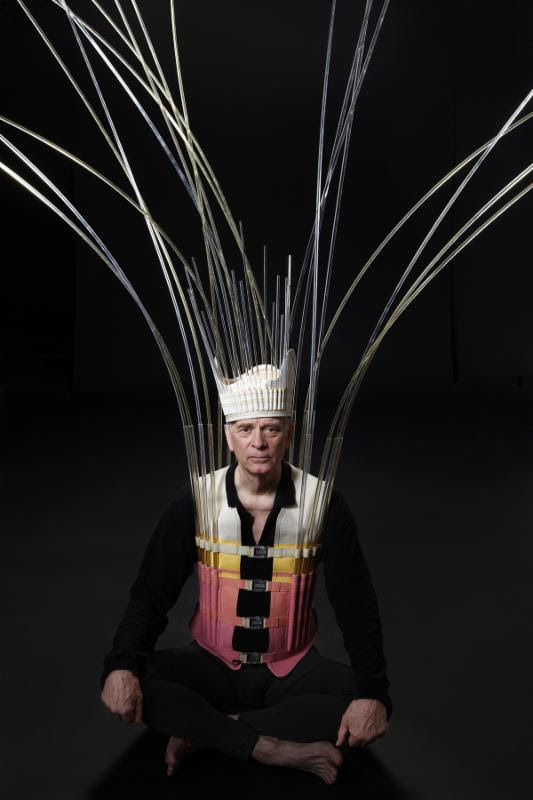 Douglas Dunn has been dancing and making dances for forty-three years. He likes to collaborate with poets, painters, sculptors, musicians, composers and playwrights to offer a multifaceted theatrical experience. He has set pieces for many companies besides his own, including the Paris Opera Ballet, and has composed numerous outdoor and site-specific events. He is renowned as a teacher of Technique and of Open Structures, with a long tenure at NYU’s Steinhardt School of Culture, Education, and Human Development. Awards include a Guggenheim, a Bessie, and Chevalier in the Ordres des Arts et des Lettres. Douglas produces Salons at his studio in Soho, and is a Board Member Emeritus of Danspace Project/St. Mark’s Church. In 2012 his collected writings, available via Amazon.com, were published under the title Dancer Out of Sight. For more information about Douglas Dunn & Dancers, visit www.douglasdunndance.com.